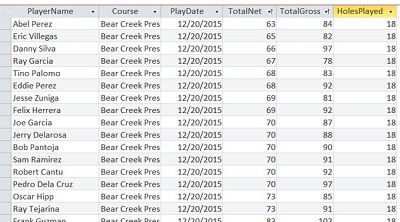 This Microsoft Access program helps you set up and determine skins winners for a multi-day golf outing. It starts with putting together the foursomes or groupings randomly so that the players are paired differently each day. 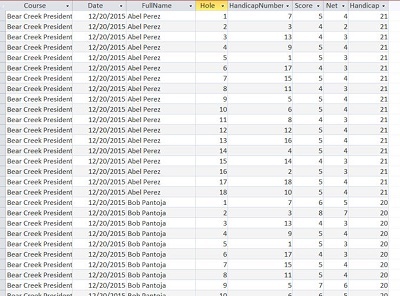 It calculates a golfers net score based on his individual handicap and the hole handicap. It will make the skins calculation and show you the GROSS and NET skins winners with the push of a button. 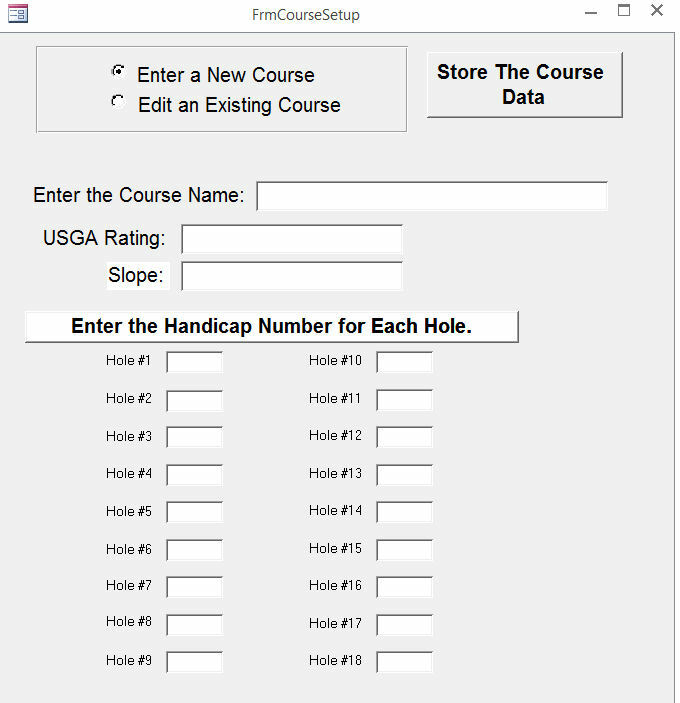 First, you enter the golf course name with each hole's handicap number. Then you enter your players by name with their handicap. Your final step is to enter each player's actual score for each hole. 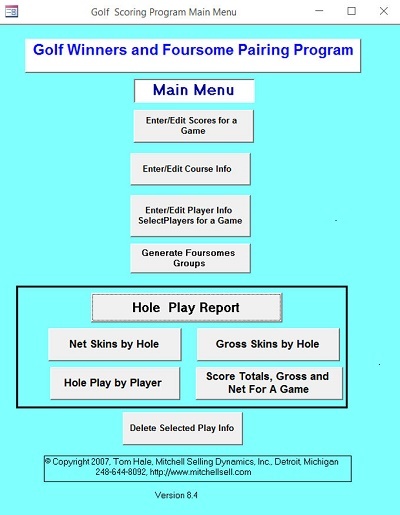 After all players' scores are entered, the program determines the hole winner (skins winner) based on gross AND net score. The program will allow the user to enter a large number of players and a large number of golf courses. All that is required is that you know the golf course handicap number for each hole, the player's handicap and the player's score on the hole. The program opens to a panel with buttons for each action that you will want to take. 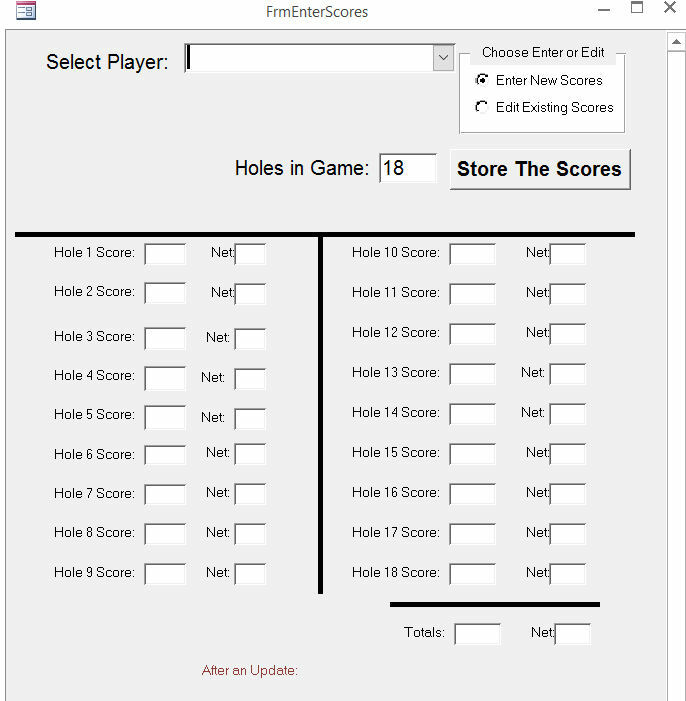 Add or edit players, add or edit golf courses, enter players' scores, generate random foursome pairings, determine skins winners and more. 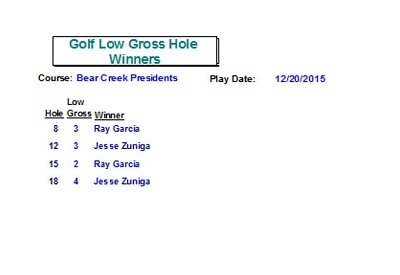 Once you have the golf course score card you can enter the handicap ranking for each hole on the course. Many golf courses have their score card on the Internet but you can call a golf course on the phone and get this information right on the phone. There is a button activated table to enter each player's name and handicap. You can keep players in this table even if they are not attending a specific outing. The program allows you to chose the players that are involved in a specific outing. Once your players have been entered, the program will generate non-repeating groupings of 4 players for each day of your multi-day outing. This random foursome pairings or grouping uses our sophisticated algorithm to group players so that everyone gets a chance to play with others. The program eliminates the chance of having the same players grouped each day. 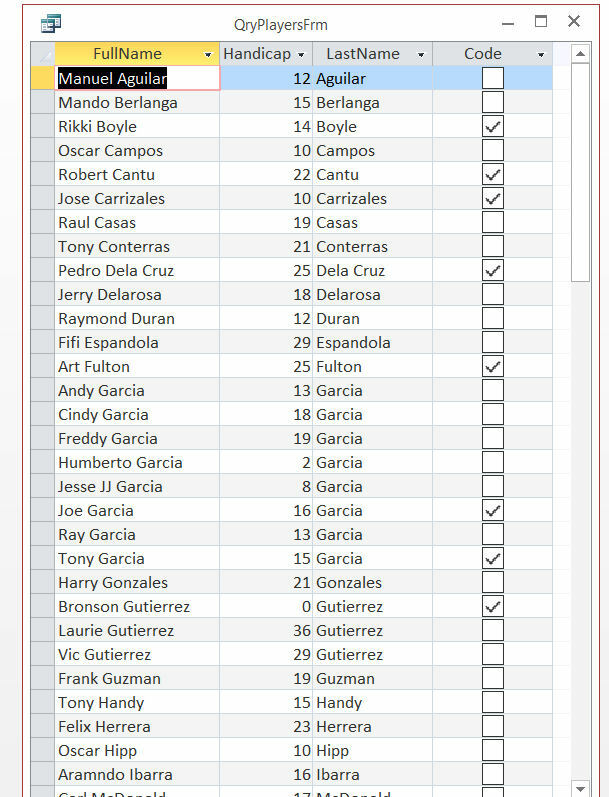 If you are the organizer you can repeatedly push the button and view as many "random" groupings as you wish, until you get a set of pairings that suites you. 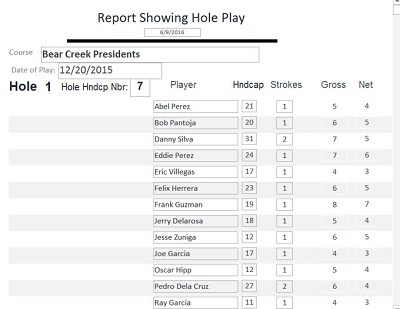 When you click on the "Hole Play Report" button on the Main Menu Panel you will see how every player scored on any hole and it has the handicap for each hole on the report as well. It shows the Player, his Handicap, how many Strokes the Player gets on the hole and their gross and net score. 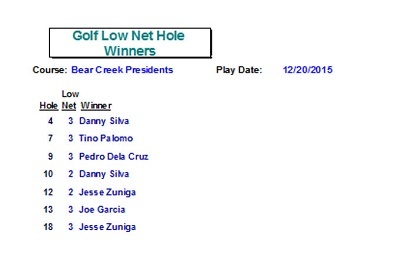 You can check all of your entries at any time by activating clicking on the "Hole Play By Player" buttont. This is a safety technique to visually check for entry errors. Previously entered courses, players and rounds can be deleted by date of play or by course. Generally, this information should be retained so that it can be reviewed or compared at any time. A reasonable amount of stored data does not interfere with the application's performance. $49. Package includes single user license for golf.mdb for Microsoft Access and an instruction book. Requires Microsoft Windows and Microsoft Access in current versions. Please contact us with any questions you may have. Support calls are free to the purchaser for the first 30 days. Click on the "Add to Cart" button below and you will go to PayPal to pay for it and then we will email it to you. Or call us at 248-644-8092; Email us at john@mitchellsell.com or send a check to the address below and we will email the file or mail a CD to you. The "Add to Cart" button will allow you pay by PayPal or Credit Card.